In the 1800s, a semicircular extension of the sea wall at Oriental Bay was built to continue the line of the picturesque and popular coastal promenade. Jutting into the harbor itself, encompassing a platform with a band rotunda at its centre, the new construction became a prominent city landmark and a successful public space in its own right. In the 1930s an art deco bathing pavilion was built into the platform which, although public in use, diminished its status as a successful civic space. The subsequent addition of a [heavy and monolithic] second level for a restaurant conversion in 1985 was the final nail in the coffin for this former public resource. 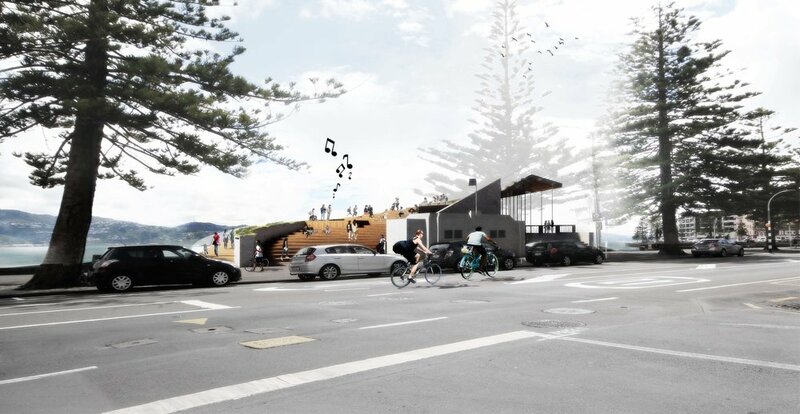 This design concept intends to return its use to the 19th century’s noble intentions by reclaiming the space for Wellington’s public. Slicing diagonally through the layers of history, (removing the earthquake-prone 80’s addition and preserving part of the early 20th century intervention) the platform will re-establish its connection with the promenade and original sea wall. A lightweight timber shell will step up towards the northeast, creating a sheltered, sunny interior space at ground level and a tiered amphitheatre above. The heavy, closed facade commandeered by private commerce will give way to not one, but two, generous, light, outward-looking spaces for all of Wellington’s public to enjoy day and night, rain and shine, summer and winter. Reminiscent of a stingray fin in motion – a subtle reference to both the sculptural shower column on the main stretch of beach adjacent, and the resident population of rays delicately oscillating in the shallows – the dynamic form can be seen from vantage points throughout Wellington, re-establishing the location, the building and its use as a key component of the city’s cultural infrastructure.